An anti-government protester gestures to pro-election supporters outside Din Daeng polling station in Bangkok Sunday. Pic: AP. These are the unofficial results. NOTE: All screenshots are from Excel, but the data has been published on this twitter feed yesterday and elsewhere (BP got sent images from an EC print-out which matches). All % are per Excel, but when you add up the total number of eligible voters and number of people who voted it matches that of the EC figures so am fairly confident that it reflects the information provided to the media yesterday. BP: For the 2011 election, turnout was 75.73% so little under half this time. Puea Thai got 4,827,229 party-list votes in 2011, but they will almost certainly fall significantly short this time. They would be happy to get 2.5+ million votes. The decline is very clear here. BP: For the 2011 election, turn-out was 72.48% so a significant drop, but still reasonable number. 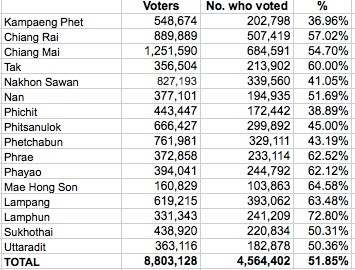 Puea Thai got 7,267,740 party-list votes in 2011 whereas this time, they will likely get only around 5+ million votes. If you were using a single decimal point, turn-out is 50% in every province. Fairly consistent in the mid-50s with Nong Bua Lamphu (72.5%) and Bueng Kan (70%) and being the exceptions. BP: For the 2011 election, turn-out was 77.16% so a significant drop, but still reasonable number. Puea Thai got 3,290,431 party-list votes in 2011. Clear difference between the Lower North (Kampaeng Phet, Nakhon Sawan, Phichit, Phitsanoluk, and Phetchabun) which were all under 50%, but other provinces mainly in the Upper North are all above 50%. Many including the smaller provinces of Tak, Phrae, Phayao, Mae Hong Son, and Lamphun (as well as larger province of Lampang) got above 60%. Would expect to see Puea Thai get around 2.5 million votes in the North. BP: In the Deep South, they turned out albeit in less significant numbers than in 2011. 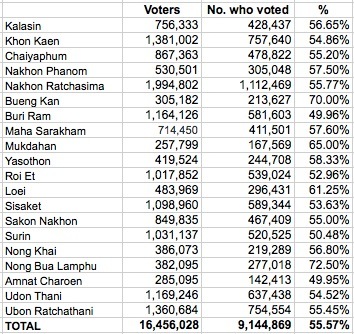 According to the EC, 20,468,646 voted out of 44,649,742 for a turn-out of 45.84%, but one problem with this can be clearly seen from Nakhon Sri Thammarat where they count all eligible voters (1,153,060), but only a few small number of polling units were voting (oddly, though for Satul, they only count the polling units that were open). * For some provinces, this does not really matter, particularly Pattani and Yala where almost all polling units were open. However, for Nakhon Sri Thammarat , Bangkok, Rayong, and Prachuab Kirikan, it does matter (also for Satul too, but the EC corrected this in the info provided). It is kind of complicated to calculate exactly how many voters could have actually voted this time around as BP does not know how many people were registered to vote in each of the polling units that were open and how many in polling units that were not open, but have averaged out over the provinces where there disruptions and this means that the number of eligible voters was around 42,995,826 with 47.61% turn-out. 3. The best base is not the 2006 election when you have an active campaign for a ‘vote no’, but the 2007 referendum where the turn-out was only 57%. This was 57% with no obstruction of voting and no violence. 4. Because of the reasons stated in 1, 2, and 3, BP expects turn-out to be around 48-53%. BP: Once the advance voting and out-of-constituency revote happens BP expects the official EC figures to move up closer to 47-48% turn-out. It will be difficult to get to the 50% threshold, BP is sure the government would be hoping for as it would be a psychological threshold that they could point to (well this was the whole purpose of Abhisit and other senior Democrats not voting as to deny any legitimacy of the current electoral system and the government). The government’s problem over the mismanagement of the rice-pledging scheme is obvious and there is no clear enthusiasm for the party with lackluster turn-out in the North and the Northeast although lack of any campaign and enthusiasm for positive feeling that you get with an election campaign to vote for a party was not there so this is why BP was not completely surprised. The government though needs to get this enthusiasm back for any future election. Nevertheless, 20 million people voted so how do you get a People’s Council and a complete change in the system? Elections enable you to propose something and then the people vote for you, but it is hard to say what those who didn’t vote (or even the ‘vote no’ as unlike in 2006 when there was a clear campaign to ‘vote no’ to oppose Thaksin means) as around half didn’t vote previously. Yes, many will be Democrat voters and/or supporters of the PDRC, but it still becomes difficult to pinpoint their level of support. btw, you will notice a statistically unusual trend of 15 of the results being a very round figure even though 2 decimal places have been used, ie. 30.00%, 35.00% etc. This is slightly better than the print-out which shows more than 25 as it seems they oddly rounded it even though using 2 decimals places were used. *This is a guess, but it is based upon the fact that in the 2011 election there were 1,112,309 eligible voters in Nakhon Sri Thammarat and 204,461 in Satul so this is the only conclusion that BP can come too.